Aspiring writers, pay attention to this one! Here's a chance to win a pitch session with Regina Brooks (Serendipity Literary Agency) -- without sending a query or pitching your WIP. All you need to do is follow this LINK and submit the title and the first 250 words from the opening of your original YA novel. This contest is open from 11/1 - 11/30, in honor of NaNoWriMo. The GRAND PRIZE winner has the opportunity to submit a FULL manuscript to Regina, along with a 10-week writing course. But there are a total of FIVE major winners. FIVE. Who each get a 15-minute, one-on-one session with Regina, plus commentary on their submission from editors at HarperCollins, Penguin, Harlequin, Random House, and Sourcebooks. Along with a one-year subscription to The Writer magazine. 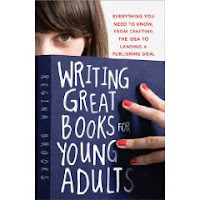 The top TWENTY all get an autographed copy of Regina's book, Writing Great Books for Young Adults. Not too shabby! During the call, winning writers can either pitch an individual project and receive pointers on presentation and concept, or ask the agent questions about the publishing process. As with any conversation with a literary agent, there’s always the possibility that she may request the entire manuscript. Made of awesome. I may be drooling slightly. Regina (and Gotham Writers' Workshop, Sourcebooks, and the rest of the Serendipity Literary Agency), thank you thank you thank you for this opportunity! Good luck everyone! Let me know in the comments who else is entering. OME! Thanks for the update! So exciting!